Materials handling specialist Manitou has recently added a new underground mining basket to its expansive range of solutions for the mining industry. 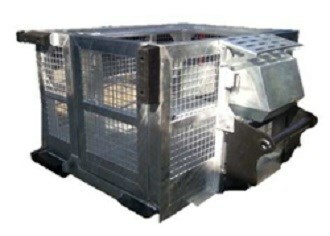 Manitou has added a new underground mine basket to its range of mining products. Manitou Mining Activities Manager Emmanuel Amandjules says the development of the new product was a direct response to users’ needs for a safe and robust personnel lifting solution. "With the addition of the Underground Mining Basket to the range of mining solutions, Manitou has a complete offer for safely lifting personnel in an underground mining or tunnelling application," he says. According to Manitou, the new basket is compliant to all international and local safety standards including AS1418.10. The underground mining basket is compatible with a wide range of Manitou’s telescopic handlers, ranging from three tonne to 22.5 tonne and lift heights of 10m to 18m. The product is now available in Australia via Manitou’s Australian dealership NTP Forklifts. The company will exhibit the new attachment at the upcoming MINEX expo in Mount Isa in May 2014.